The "Pooh & Friends" series is no longer being made; when our supply is gone, we cannot get any more. "One Little Star Makes a Difference"
This is the first Christmas figure introduced in the Pooh & Friends collection. Released for Christmas 1998, the charter year of the collection, this figurine is crafted of high quality fine bisque porcelain. 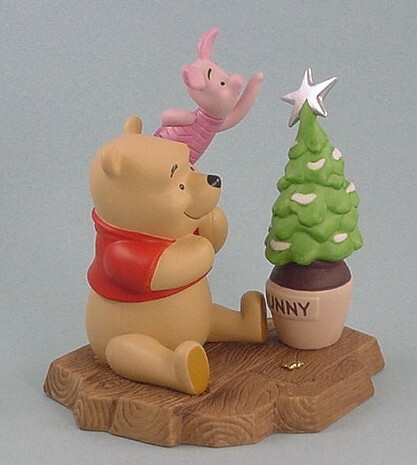 Reliving simpler times, Pooh and Piglet are putting a star atop their Christmas tree. This figurine is now retired. All of the figures produced in the charter year of 1998 have on the base a 14k gold-plated charm ... a honey bee. This special honey bee adds to the value of this very special Christmas figurine. Add this special Christmas piece to your collection ... enter the Hundred Acre Wood and re-live the simpler times with the world's most popular bear! This Pooh & Friends figure will come in its original box with certificate of authenticity. This is the first Christmas ornament introduced in the Pooh & Friends collection. Released for Christmas 1998, the charter year of the collection, this ornament is crafted of high quality fine bisque porcelain. The ornament has the 14k gold-plated honey bee charm. This ornament is now retired. This Pooh & Friends ornament will come in its original box with certificate of authenticity. Released in 1998, the charter year of the collection, this figurine is crafted of high quality fine bisque porcelain. 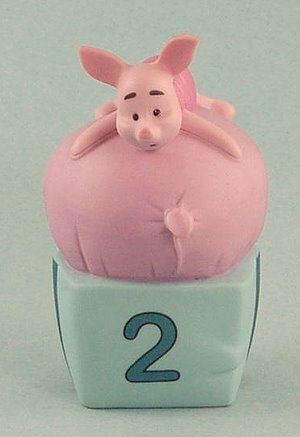 This figurine with "Piglet" has a 14k gold-plated acorn charm. 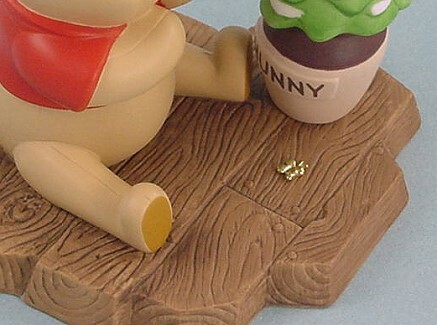 The figurines with characters other than Pooh have an acorn charm. 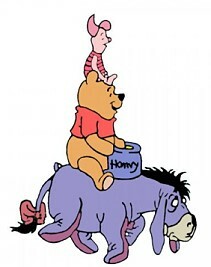 Those with Pooh have a honey bee charm. Sentiment on bottom: "TWO is for growing fast and faster." This Pooh & Friends figurine will come in its original box with certificate of authenticity.